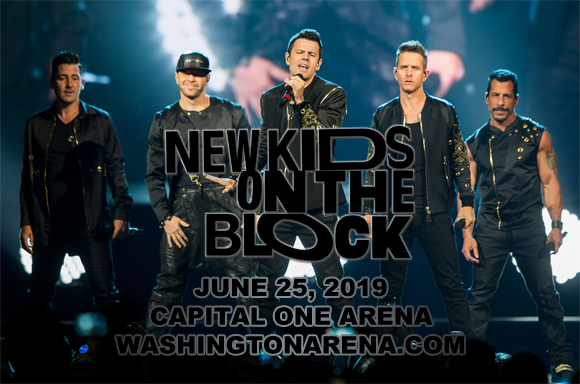 Get ready to bust some moves, early '90s style, as New Kids On The Block come to Capital One Arena with Salt N Pepa & Naughty by Nature on Tuesday 25th June 2019! The all-singing, all-dancing boy band (man band…?) are on The Mixtape Tour – a nostalgia-fest that's guaranteed to get you working it like back in the day and singing along to every lyric! It's gonna be totally sweet! Word! Trailblazers of the boy band craze of the 1980s and 1990s, during which they sold over 80 million records, American pop group New Kids On The Block formed in Boston, Massachusetts in 1984. Currently consisting of brothers Jordan and Jonathan Knight, Joey McIntyre, Donnie Wahlberg, and Danny Wood, the group became a household name in 1988 with the release of "Please Don't Go Girl", from the album Hangin' Tough. The song made its way to number 10 on the Billboard Hot 100 Singles Chart, and was the first of five top ten singles for the band, which was a first for a "teen" act. By the end of that year, the album had made it to to number one on the Billboard 200 Albums Chart and had gone eight-times platinum. Their popularity grew worldwide and in 1990 the group won two American Music Awards: Favorite Pop/Rock Band, Duo, or Group and Favorite Pop/Rock Album. The group disbanded four years later, having released five albums together, but after a hiatus of over a decade, they reunited secretly in 1997. The group began recording together covertly, and in 2008 they released the album The Block. The group has continued to tour and record together since then. In 2014, New Kids On The Block were honoured with a star on the Hollywood Walk of Fame.